The other day I was perusing a news site that had posted an article about a few “healthy” recipes. While I like to read the article, the comments are always what seem to grab my attention. Without looking, I can tell you what you would probably find in those comments: a lot of bashing, hate, and generally a lot of “I’m right, you’re wrong and an idiot because you don’t believe the same thing I do.” It’s horrible really. In a different article, I read that each year more and more Americans are getting back into the kitchen and cooking at home. The article made me extremely happy, I actually cheered out loud. I think that it’s easy to look at all the information about “healthy” and what’s good/bad for you and feel overwhelmed. Yet the food you eat, it’s a personal choice- a personal journey. In the end, I don’t have an opinion on what you’re cooking but I will be glad that you are cooking. It feels like we are making slow strides to improve our food system and yet, we focus on such minute details as “vegetarian” or “paleo.” It’s time to stop bashing and start focusing on ourselves (and not everyone else). 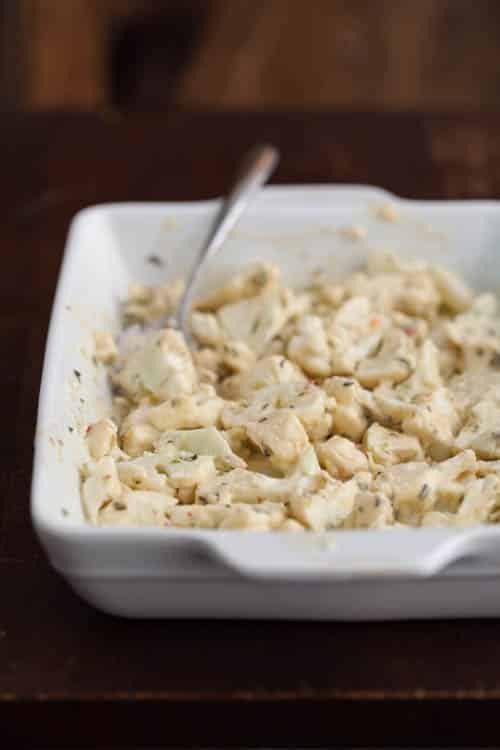 This Thai cauliflower comes together fairly quickly and is packed full of flavor. I found this lovely fresh thai paste at my grocery store. The paste was chocked full of garlic, ginger, lemongrass, and cilantro- it was extremely refreshing. However, I think a thai red curry or the lemongrass paste I linked to in the recipe would be a perfect substitute. Like with most grain/pasta based meals- feel free to change out the couscous to something you might have on hand (or better suits your diet- I think millet would be the perfect gluten-free sub). Preheat oven to 425˚ F. Cut the half of cauliflower head into small, bite sized florets. Place in on large sheet pan. In a small bowl, whisk together the thai curry paste and yogurt (or coconut milk). 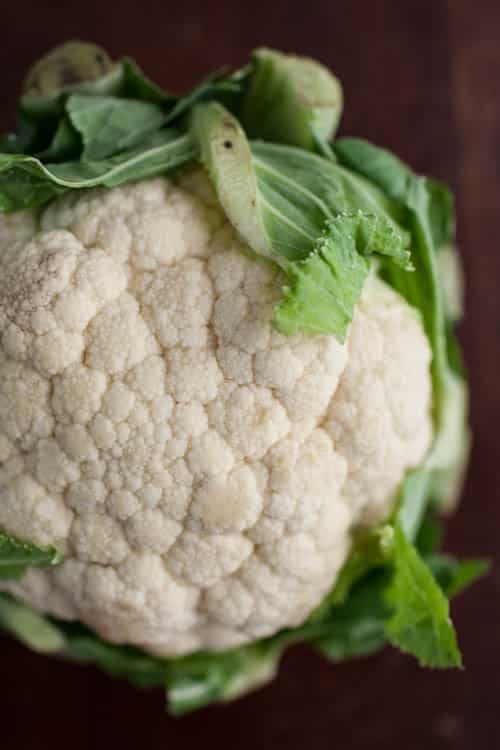 Combine with cauliflower and toss until the cauliflower is well coated. Bake for 25-30 minutes until tender. 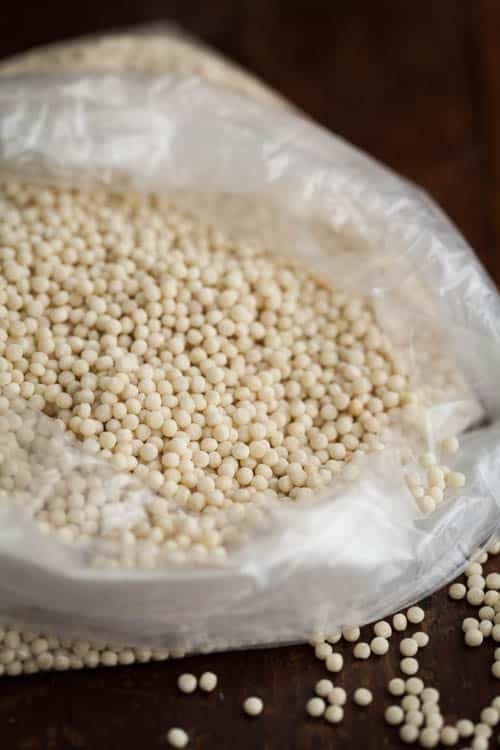 While cauliflower cooks, combine the pearl couscous with 1¼ cup water. Bring to a boil,reduce to a simmer, cover, and let cook until the couscous is tender (like an al dente pasta) and all the water has been absorbed, 8-10 minutes. Remove from heat and fluff with a fork. In a bowl, combine the roasted cauliflower, cooked couscous, 2 tablespoons cilantro, 2 tablespoons peanuts, and red pepper flakes if using. 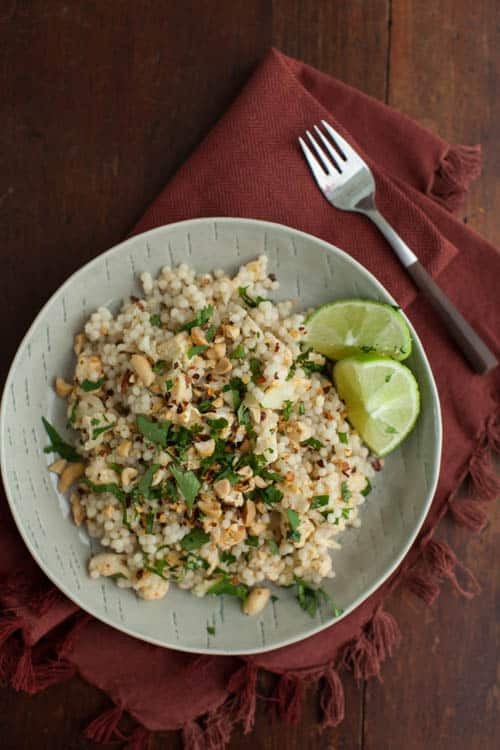 Toss together and serve with the extra cilantro, peanuts, and a few squeezes of lime juice. 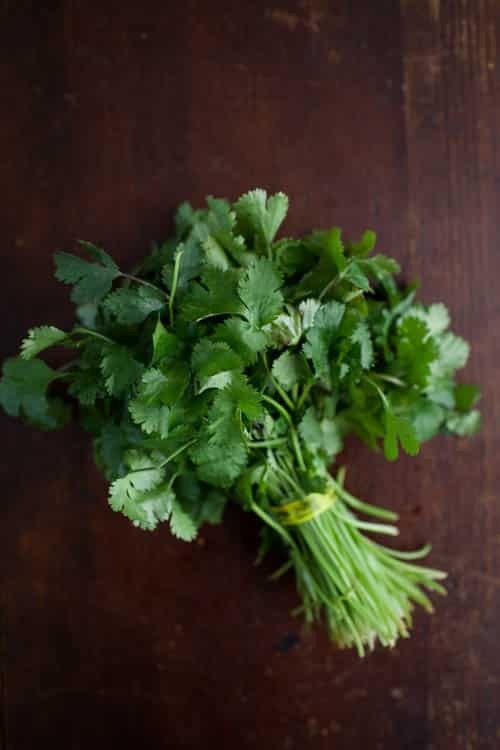 *the fresh thai paste I purchased was more of a lemongrass paste with a bit of cilantro thrown in. 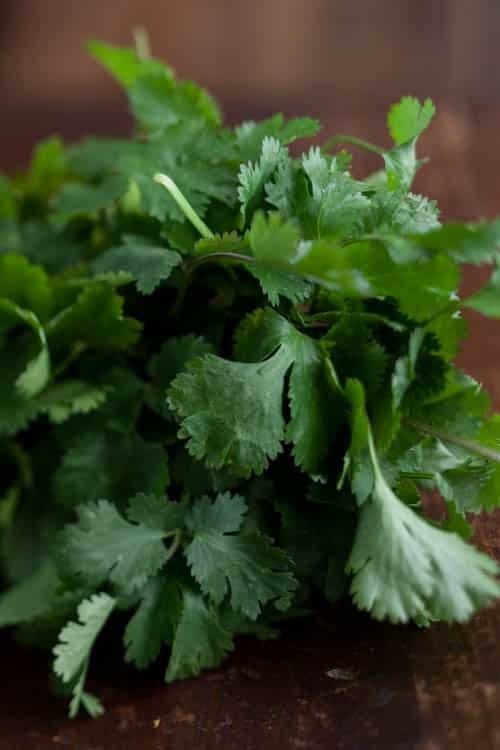 While you can use a thai curry paste, you can also make a lemongrass paste that would more resemble what I used (along with a bit of cilantro). I completley agree with you on this one, I get so frustrated when I read the comments on articles that I just had to stop doing it. Such time is wasted in these arguments on articles! 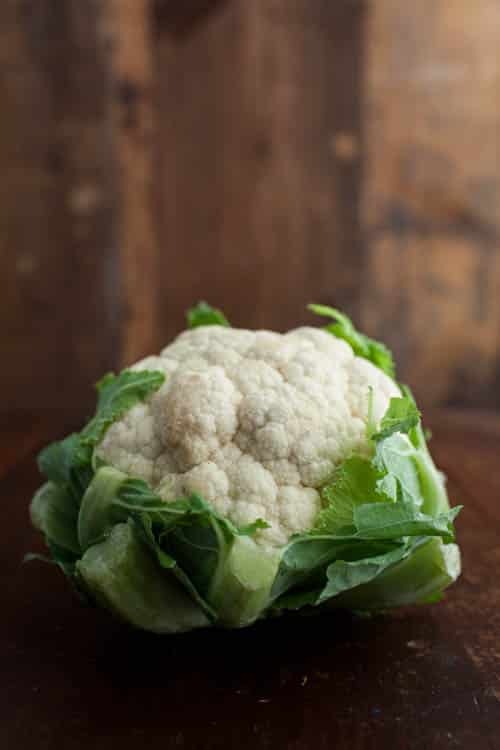 I have cauliflower waiting to be used in my crisper, so I can’t wait to try this! There are so many fun flavours in here! This looks great! This looks wonderful. I don’t use Thai flavours nearly enough. Know exactly what you mean about comments on those kinds of articles. I always tell myself I won’t read them as the bashing and negativity brings me down, but I always end up reading them anyway! What ever happened to “If you can’t say anything nice don’t say anything at all” ?! Oh, I’m so with you. I don’t know why so many people feel intent on judging everyone else’s food choices. What you eat is nobody’s business but your own! What’s the name of the thai paste you found at the store? Is it a curry paste or no? I googled “thai paste” and it only came up with curry ones. I’m blanking at the moment but I’ll let you know after I head to the store next! 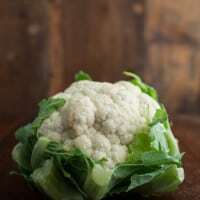 I have to admit that I’ve never liked cauliflower, and I have distinct memories of hiding it in my napkin as a child. But this recipe looks delicious! I will definitely have to give it a try, and rethink my opinion of certain vegetables. Thanks for sharing! Cheers to less bashing and more cooking! Lovely recipe. Totally with you on this. I hate didactic-ness because I feel like it steers people away from the things that really matter…like just getting in the kitchen! Mmm thai. My favorite flavors. Yay, it’s cauliflower season! I’ve never thought to pair mine with Israeli couscous before–such a great idea. And you have to love all the intense spice of Thai spices. Totally know what you mean. I wonder why we can’t all just be happy and supportive of each other! I love this meal it looks so warm and cozy for winter. Pinned. I am totally with you on this. I just can’t do food politics and how ugly people get makes me sad. We all have our own journey and what is right for one person isn’t necessarily right for the other. I think most people are doing the best that they can from where they are right then and positive change is rarely brought on by harsh judgment. Who has ever said “Oh, you are telling me I’m an idiot for how I eat, I want to be just like you”? This looks fabulous! I don’t make Thai in my kitchen nearly enough. I’m crazy about cauliflower and cilantro so adding them together makes me a super happy girl! The joins of cauliflower! I just found your site through the millet porridge link Heidi had on her favorite’s list. I’m looking forward to following! This dish looks like a delicious and quick weeknight meal! 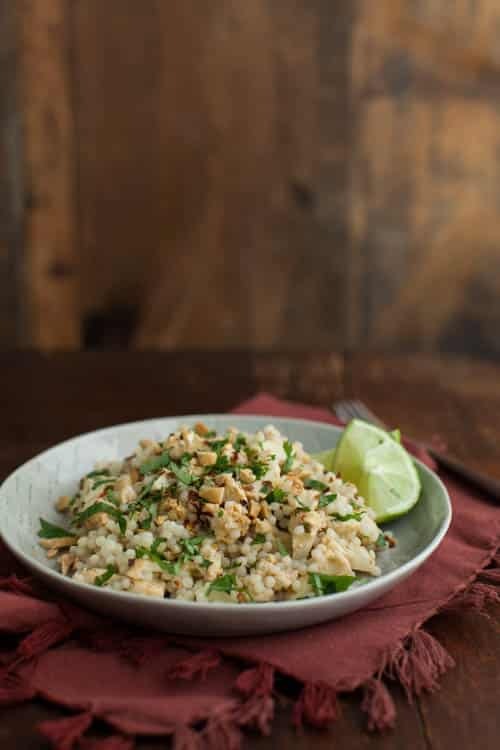 I find the warming Thai flavors especially comforting in the winter, and the texture combination of roasted cauliflower and pearl couscous seems lovely. I love thai stir frys. They are my go-to weeknight meal. I’ve never used cous cous before though, and I think that would add a nice texture! Delicious! This will definitely become part of a regular rotation of favs!